DESPITE THE HATE, SHOULD MAYWEATHER'S RETURN CONCERN PACQUIAO? This week kicks off the press tour for the Mayweather vs. Ortiz welterweight showdown as the boxing world prepares to celebrate the return of Floyd Mayweather Jr. to the sport's landscape this September. And yes, make no mistake, we are celebrating because love him or hate him, you can't deny the fact that Floyd Mayweather makes boxing far more interesting. 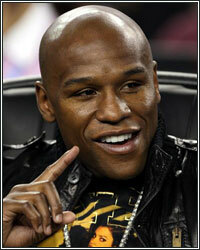 In fact, to the general American public, Floyd is one half of their entire interest in the sport. Boxing is not dead, mind you; far from it. The Klitchkos can regularly sell out stadiums in Germany. Tomaz Adamek sells out arenas on his Polish fanbase alone. Mikkel Kessler can do the same in Denmark. David Haye and Carl Froch are just as popular in England. Even an up-and-comer like Saul "Canelo" Alvarez can sell just as well in Mexico, his last fight bringing in 36 million viewers. Boxing is dead? I don't think so. Boxing simply appears to be dead in America because the marquee division - the heavyweights - no longer draw the most talented big athletes in the world, who instead choose other sports with more lucrative potential for men of their size. We may never see the heavyweight division as popular as it was decades ago for that very reason, but in the meantime, we at least have two superstars in Floyd Maweather and Manny Pacquiao who regularly bring in more viewers than the last star of the sport, Oscar de la Hoya, did in his prime. For as rare as these stars are, we have to be thankful that a personality like Floyd Mayweather exists. It truly is personality and charisma that makes Floyd the star that he is. Over the course of his career, Floyd has brilliantly managed to craft an image that is a bigger-than-life characature of himself so as to become the ultimate villain in boxing, one we haven't seen since Muhamud Ali. When he broke into the mainstream on HBO's 24/7, the world got a look at an athlete who, despite being an absolute genius in the ring, often came off in the real world as an obnoxious, childish, foul-mouthed braggart, flaunting his earnings, mocking his opponents, and repeatedly reminding us of his flawless record in each new episode. It's because of that behavior that such a large proportion of the sport's public both can't stand him and can't stand not to watch him fight. Will this be the one where he finally gets knocked out? Will this be the one where he finally eats his humble pie? The general consensus from his haters is that so long as they tune in to watch him fight, there will always be that small chance that they will get to witness, live, that special moment where his walls all come crashing down and the enormous ego is shattered. Regardless, this entire time, he has entertained you. He's given you someone to root against. The Floyd Mayweather Show has brought us the Mayweather-Pacquiao narrative, which has been among the most compelling in sports the past few years; right up there with "The Decision" and Tiger Woods' numerous affairs. With Floyd and 24/7, we were also introduced to the Mayweather family. The "Manny fights for his country/Freddie Roach has Parkinson's" story, as compelling as it is, got old by the second time through, but the Mayweather family seems to never cease to amuse me. Whether it's Roger pushing a cart through the supermarket, Floyd Sr. ordering food at a Taco Bell drive-through, or Floyd's #1 guy, 50 Cent, riding a segway through the Big Boy Mansion, the Mayweathers seem to be the gift that keeps on giving. I know this is not the usual negative commentary you're used to reading on Floyd. I try to view things for what they actually are, and when I see Floyd Mayweather Jr., I see a man whose tremendous talents in his sport are only matched by his charisma outside it in a world mostly full of boring athletes with vapid personalities. I "get" Floyd. I can see why so many people absolutely dislike him, but I can also see a guy trying to earn the other half of prizefighting by presenting himself as something out of a comic book. It's a shame that more people can't see it that way. But it's an even bigger shame that his haters seem to stop at nothing in distorting his record or discounting his success so as to project their loathing. To the haters, Floyd's undefeated record means nothing because he ducked anyone who was ever any good, and everyone else was either too small or old and washed up. To the haters, he can make all the money in the world, but that won't matter because "I can see the finish line with this guy and surely he'll end up broke like the rest of them." And to the haters, of course it's all his fault that the big fight with Pacquiao hasn't come off yet. So let's first look at that undefeated record Floyd is so proud of, and deservedly so. This isn't Rocky Marciano padding his record with over forty bums before winning the title and defending it just six times. This is a champion who won his first title over twelve years ago and has had over twenty world title fights since, without a single loss. How did he do it? According to the haters, largely in part by ducking fighters left and right. Even though he fought Corales and Castillo, not getting around to Casamayor was a blatant duck job, according to his haters. He allegedly also ducked Kostya Tszyu, even though the same month Floyd was fighting in his first PPV against the far more popular (at least in America) Arturo Gatti, Tsyzu was knocked out by Ricky Hatton, who Floyd eventually did face. Upon his foray into the welterweight division, he supposedly ducked Cotto and Margarito, even though Cotto was new to the division and he and his handlers wanted no part of Floyd, and the opponent Floyd opted to fight instead of Margarito, but for the same price - Carlos Baldomir - was the lineal champion, while Margarito just held a paper belt. And for as unknown as Baldomir was to the general public, Margarito, at the time, was even more anonymous. The following fight was against Zab Judah, a long-awaited grudge match against the previous lineal champion and once again against a legitimate threat who brought far more money to the table than Margarito. Floyd then allegedly performed the "cowardly act" of pursuing every fighter's dream of making a huge payday against Oscar de la Hoya for a title in a higher weight class he'd never fought in previously. He then extended his cowardice by following that fight up against the undefeated Ricky Hatton, whose swarming, high-pressure style was supposed to pose a nightmare to Floyd, and also brought with him a legion of fans, media attention, and of course money. He was also ranked #4 pound-for-pound in the world at the time he fought Floyd. In fact, let's observe some of the pound-for-pound rankings of Floyd's most recent opponents. At the time he fought Mosely, Marquez, Hatton, and De la Hoya, each was ranked #3, #2, #4, and #9 on the pound-for-pound rankings, respectively. Does that sound like a guy who ducks fighters and "hasn't fought anybody"? The irony, of course, is that Floyd's selection of his latest opponent, Victor Ortiz, ranked #2 at welterweight and a young fighter in his prime, seems to have drawn the least amount of criticism I've heard in years, despite Ortiz probably not even being considered a top 20 pound-for-pound fighter. Go figure. But so is the logic and revisionist history of Floyd's haters. The counter argument from them, or course, is that most of these guys were either "old and past their prime" or "small and blown up." But Mosley didn't look so old against the last guy he fought before Mayweather when he starched Antonio Margarito, and De la Hoya didn't look so old when he did the same to Ricardo Mayorga six months prior to fighting Floyd. And was Ricky Hatton really at such a severe weight disadvantage? Whereas most great fighters progressively move up in weight throughout their careers, Hatton stayed at 140 from the start. In fact, at the same time Hatton started his career in the late 90's at 140 pounds, Floyd was winning his first title at 130 pounds. But I guess ten years into his career, having to finally move up that one whole weight class must have made all the difference in Hatton's performance, right? Yes, Marquez was absolutely at a weight disadvantage, but after seeing him lose every second of every round of their fight, I don't need to wonder how things would have turned out had they met at lightweight. But the haters still crticize, how dare Floyd choose the #2 pound-for-pound fighter in the world as his tune-up after a 21-month long layoff. The reality is that if you scrutinize any great fighter's career who has been around the block, you'll find many viable opponents he never got around to fighting, and many of whom were not in their absolute prime age or weight class. The difference though is that while it's simply a breaks-of-the-game for the sport and the rest of its fighters, with Floyd, it's allegedly evidence of his undefeated record being bogus. At least, to the haters it is. Why do fighters sometimes never get around to fighting the best opposition at the best possible times? It's because boxing is a form of prizefighting, in which all fighters and their handlers measure the next move in acquiring the greatest reward against the least amount of risk. This doesn't apply to Floyd, however. To his critics, Floyd must fight the biggest threats every time, all the time, consequences-be-damned and regardless of the purse being offered. Anything else and he's ducking someone. The double standard is remarkable. Manny Pacquiao has won titles in eight divisions, but only four of them were against lineal champions. Am I to assume that he ducked the lineal champions from the other four weight divisions? Sugar Ray Leonard didn't duck Aaron Pryor or wait for Marvin Hagler to get old, but Floyd? He ducked Kostya Tszyu and is waiting for Manny Pacquiao to get old. Ah yes, the preemptive excuses as to why the other guy lost or why Floyd's victory means nothing. The haters prepare it before every fight, and mark my words, when Floyd mows down Victor Ortiz - an overly aggressive puncher with average skills and no defense to speak of, a.k.a. perfect for Floyd - if it's anything less than when Maidana made him quit in six rounds a few years ago, we'll be sure to hear it. And if he ever does get around to fighting Pacquiao and beats him, we all know why. Pacquiao was past his prime, of course. Floyd waited for him to get old. Had they met two years earlier, things would have been totally different. The victory means nothing. As for the potential outcome of that fight, ask any casual sports fan who hates Floyd with a passion and you'll hear some forced answer as to how if Mosley could get to his chin, then surely Manny could and he'd finish the job. But ask any true boxing fan with knowledge of the sport as to how to predict fights and they'll all tell you the same thing - styles make fights. For as amazing a puncher as he is, Manny is there to be hit. If his two wars with Juan Manuel Marquez have told us anything, it's that counter-punchers are Manny's kryptonite. Guess who is probably the best counter-puncher in the history of the sport? I spoke to Freddie Roach one time about that very issue and asked him how his fighter beats Floyd. He told me, "Well...we beat him on activity...and Floyd hates southpaws. Zab Judah almost knocked him out." Does that sound like an immaculate battle plan, or simply wishful thinking? We all know that Floyd has faced many high-pressure, high-activity fighters, but his defense and counter-punching have shut them down every time. Floyd apparently doesn't seem to "hate southpaws" enough to not want to fight Victor Ortiz in September. And winning three rounds and one clean blow to the face does not constitute Zab Judah almost knocking Floyd out. The haters love to point to that punch, and the two Shane Mosley landed against Floyd in the second round of their fight, as evidence that he can be knocked out, but if anything, it speaks to how impeccable Floyd's career has been that after 41 fights, we can all remember the few times he was ever caught flush on the chin. If the roles were reversed, we all know that not only would Floyd still be the one accused of ducking Manny, but Floyd would also be accused of being a roiding cheat by the entire sports media without the word "defamation" being uttered by anyone. The entire situation itself speaks to how biased and distorted the view towards Floyd Mayweather really is by so much of the supposedly objective sports press. Does it really sound that unreasonable for enhanced drug testing to be required of athletes in an event of this magnitude, in this day and age? What does sound unreasonable is that while there are many athletes from other sports, who will place dead last in their competitions that will never be aired on television, will be subjected to the random blood testing without any qualms. However, one of the two players in not just the biggest fight of all time, but one of the biggest sporting events of all time, has come up with every excuse in the book as to why he should have to avoid it. He's superstitious about having his blood drawn. He was afraid of needles, at least until someone pointed out the numerous tattoos on his body. My personal favorite was his explanation on Jimmy Kimmel Live, that because Floyd is naturally bigger, when that small vial of blood is drawn from their bodies, Floyd would be have a disproportional size advantage in terms of what their bodies were left with after the blood was drawn. Ummmm...yeah...okay. If the lack of consistency in that story isn't laughable, then the general public's acceptance of it should be. We live in an era where the best PEDs out there, like HGH and blood doping, simply cannot be detected unless blood is drawn within the 24-48 hour window from when the drugs entered the body, and don't let anyone tell you otherwise. Famous boxers like James Toney and Fernando Vargas have all tested positive for steroids. Shane Mosley and Tommy Morrison have confessed their past use as well. And in that combat sport just down the street, mixed martial arts, probably a quarter of the named fighters in the sport have tested positive for PEDs at some point. You still don't think that enhanced drug testing ought to be implemented in the biggest fight of all time? Truth be told, I don't believe Manny Pacquiao uses or has ever used anabolic steroids. I believe that he is simply one of the greatest fighters we have ever seen, and certainly the greatest puncher. I say that with no hyperbole either. And to be even more frank, as sacrileges as this might be to some - I'm far more impressed with the sheer number of champions and Hall of Famers he's run through than I am with Sugar Ray Robinson racking up over 170 wins from fighting mostly tomato cans off the turd circuit every other weekend. That's probably a shock to many because, for whatever reason, to most of Floyd's haters, the idea of being both a fan of Floyd and also a fan of Manny is inconceivable. They simply can't comphrehend the idea that someone could be a fan of Floyd's without instictively hating Manny as well. It truly speaks to how much of Manny's popularity stems from his fan's hatred of Floyd. And for that, Manny should be grateful. Yes, Manny is an amazing athlete and his style is exciting to watch, but let's not act like a significant portion of his fanbase, while cheering for Manny, are also cheering against Floyd. But none of my high opinion of Manny can prevent him from looking that much worse every time the next Floyd opponent agrees to the random blood testing up to the day of the fight. Mosley did it. Ortiz will do it. Why can't Manny? Yes, we know that egos play a huge role in this and conceding to the drug testing would, to some degree, be like Floyd winning the first round, but I think we all know what's really in play here. Manny has made it no secret that there's not much more for him to prove beyond a fight with Floyd, and following that would likely be retirement. Can you imagine how much money from potential fights would be forfeited if he fought Floyd and then rode off into the sunset? How many pockets wouldn't be half as lined had Manny fought Floyd over a year ago and never entered the ring again? It's no secret that a lot of his handlers make a huge portion of their living off Manny Pacquiao's activity in the sport, so would it be a stretch to assume that so long as they can keep the Floyd card dangling just out of reach in front of Manny, they can keep the party going that much longer? "Don't submit to to him, Manny. How dare he. You're Manny Pacquiao. Who is he to make demands of you? He's just trying to gain an unfair advantage. Don't do it. There are plenty of other fighters we can pursue." But if Manny is going to be naive about his hander's intentions with him, he should at least open his eyes to how much he's missing out on the business side. Boxing's latest bombshell is the not-so-well-kept secret that Floyd is getting a record $40 million guarantee for fighting Victor Ortiz. The implications of this are huge. It marks the biggest purse gaurantee of any fight on record. It will surely be one of the greatest overall purses a fighter has ever received. And it's also a heck of a lot more than Manny Pacquiao is making in his fights. In 2010 Floyd Mayweather was ranked the second highest paid athlete in history by Forbes behind only Tiger Woods with $65 million on almost fight purses alone. That same year Manny Pacquaio was #8 with just $42 million. How did Floyd make 50% more in salary than Manny during that same period of time, when Manny is supposed to be the most popular fighter? They both had two big PPV fights that drew in tons of buys. And how is Floyd making $40 million against Victor Ortiz, while Manny will probably only make just over half that in a third fight against Juan Manuel Marquez? The obvious conclusion is two-fold: Floyd is an extraodinary businessman as an athlete and Manny's trust in his handlers should seriously be questioned. Floyd's partnership with Al Haymon should go down as one of the most business savvy in sports history, while Manny's seemingly blind faith in Bob Arum and Mike Koncz should be met with serious scrutiny. Floyd Mayweather will make in one fight almost what the (arguably) best basketball player in the sport, LeBron James, makes in an entire year in salary and endorsements. Suppose Floyd made that same purse in a big Cinco de Mayo fight against the popular Mexican sensation Saul "Canelo" Alvarez, which is highly conceivable. Canelo's star power is fast rising, the fight would be an in-house with Golden Boy Promotions, and Floyd's fight against Oscar de la Hoya on a Cinco de Mayo was the biggest PPV event of all time. If the fight and another $40 million purse were to come off, it would earn him more for the year than what the top earning athlete of 2011, Tiger Woods, brought in last year. Do you really think Manny Pacquiao will make $40 million against Mike Jones, the latest Top Rank fighter being pushed by Bob Arum as Manny's next opponent after Marquez? All of this of course goes unmentioned by the vast majority of the sports press, who instead often choose to cross those boundaries of objective journalism, some of the most respected even going so far as to harass Floyd on Twitter. The latest atrocity was the trend a few months ago by some in the boxing press to rank Sergio Martinez over Floyd in the pound-for-pound rankings. Sergio Martinez is a phenomenal fighter and every bit deserving of his #3 slot, but to suggest that a fighter who only became champion three years ago and had a loss since then can somehow be ranked higher than a fighter who has been champion since 1998, won titles over five weight classes against world-class opposition, and never experienced a loss to blemish that record is absurd. Say what you want of his personality, but give the man credit where it's due. Since entering the sport, Floyd has made himself one of the wealthiest boxers of all time outside of the ring, and inside it, perhaps the most flawless. And no, it's not because he never fought anyone good or only fought them when they were at a severe disadvantage. It's because with Floyd, there is always a method to his madness. I can't cast judgment on his pending legal issues outside the ring, but I can say that if you hate the Floyd you've seen on TV, he's probably fine with that. It's made him a fortune and as we all know, no matter what you do, haters gon' hate. Perhaps you don't see the charismatic genius of his image, but you can't deny the tremendous success he's had as a prizefighter. Don't diminish his record as though his talents are a farce when you know that the 41-0 is legit, and stop acting like TMZ reporting that Floyd missing a car payment on one among his fleet of cars is a sign that the $40 million paycheck isn't real and destitution is just around the corner. In a sport that many have claimed to be dying, Floyd has certainly given it life.